Impossible. Playa Time takes over as soon as you leave Reno. You no longer have control over how long anything will take. In 2013 the line was stopped all the way back at Pyramid Lake. So we were happy this year that getting to the playa was quick. We had already lost a day due to the RV dying. Then we had to cull a lot of stuff that wasn’t going to fit in a car with 4 people. We made it onto gate road and waited to get in. This was the first year we had to get tickets from will call. We missed the registering for the ticket sale but scored tickets in the OMG sale. It always seems like we’re in the slowest lane. Some people especially those in RVs were sleeping instead of being ready to go when it was our turn to “pulse” and advance. DO NOT SLEEP IN THE LINE! Also STAY IN YOUR VEHICLE! End of rant. So despite getting onto the playa quickly we then lost 18 hours of our lives. 18 hours is exactly the amount of time needed to drive to Los Angeles and back when you’re already on the I-5 before you head east to Nevada. We weren’t allowed to leave. Groceries piled on everyone it was a long wait through thunderstorms, hail, and mud. 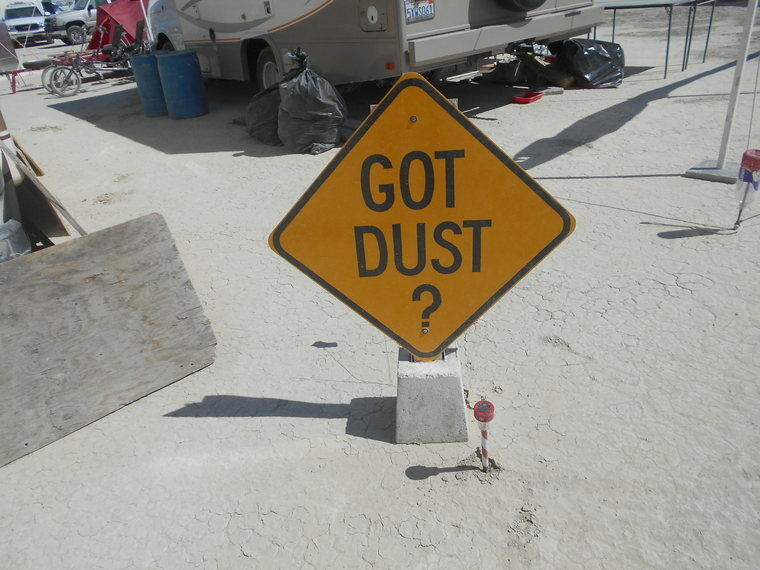 So no – time is not manageable on the playa. You can try to manage your time and I encourage that. I wear a watch. Lots of people don’t but I have places to go, things to do, and people to see. 1. Let people have their own burn. Don’t force someone to do what you want to do. 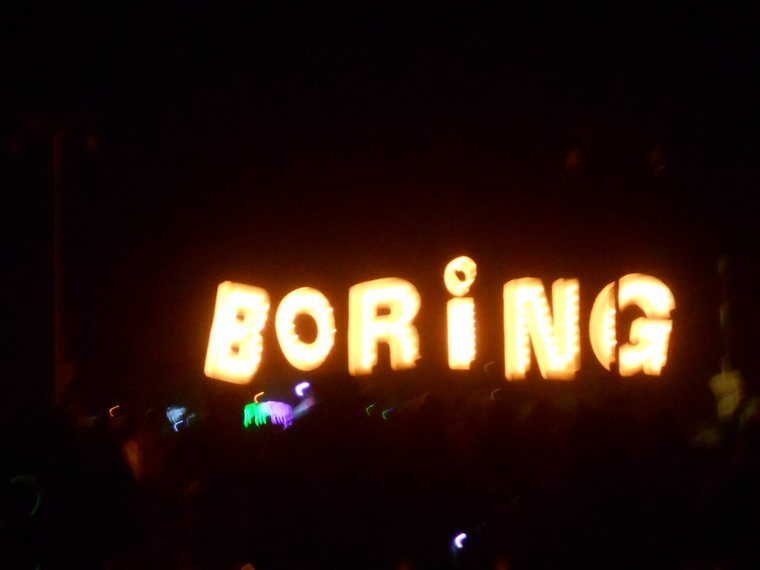 I met a couple and the husband hated Burning Man. His wife had made him go to yoga classes and other things that he wasn’t interested in. 2. You are always missing thousands of events. With close to 70,000 participants offering different things for you to do – you won’t be able to do them all. Just don’t miss the big burn on “Burn Night”. You know, the one that the event is named after? Pro tip – The Man’s arms go up about half an hour before it starts. Don’t bring bikes or chairs to any of the big burns. People will trip over them and the info you received actually tells you not to bring them. You won’t be able to find them afterwards anyway. 3. You’ll have a day you crash – so plan for it. The lack of sleep and constant activity may cause you to want to leave. Usually around Wednesday. It’s like starting a marathon running as hard as you can for the first hour. You need to learn to pace yourself. It’s high altitude, hot, dusty, and hyper active. Learn where hammock camp is. Meals are important too. 4. Be realistic about time and distance. Black Rock City is big – about 9 square miles. I was at a wedding and realized that I left my gift for the hand-tying ceremony back in my tent. There wasn’t enough time to make the round trip even with a bike. I gave it to them later. Art cars might seem to be a fast and effortless way to get around the playa. 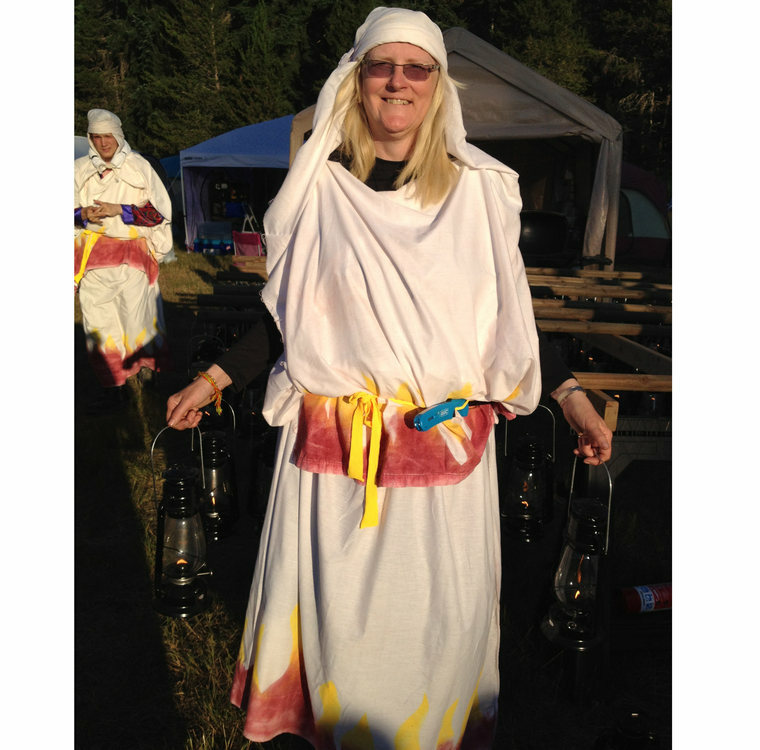 In actuality, art cars go where the driver and camp mates want to go – not necessarily where you want to go. My third year (2011) was also my first time in an art car. 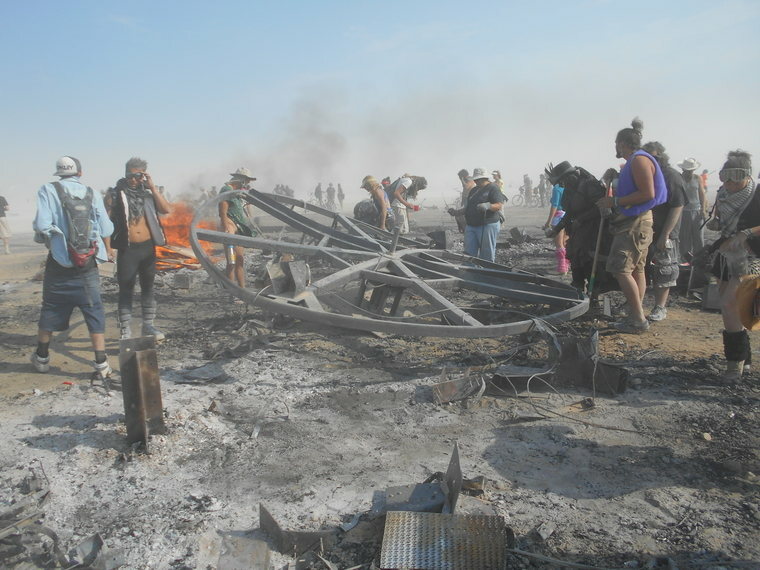 I left my bike near ThunderDome and we headed off to see the Trojan Horse burn. The Lotus Girls fireworks had just ended. You can see a lot because you’re up high but if you’re on foot you can get closer. After the burn the art car headed back to its camp for more supplies. 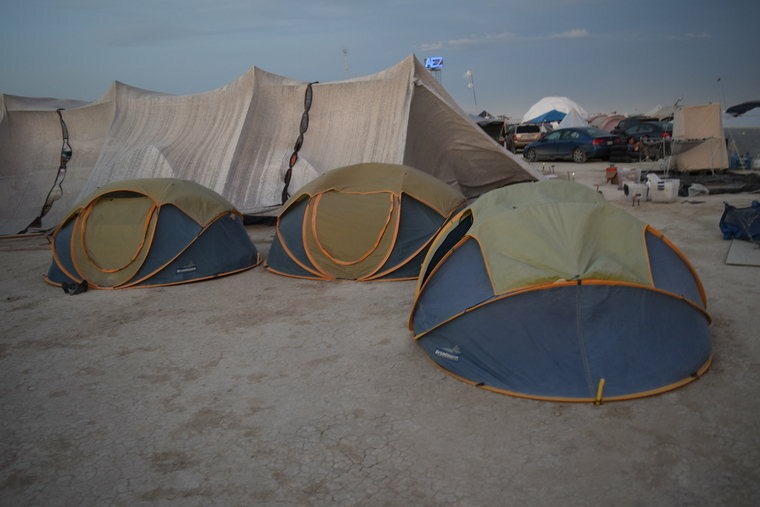 Some other people had left their bikes and their camp was on the far side of the playa. The art car camp was close to mine so I walked home. The next morning my bike had been moved. Make sure you light and always lock your bike. Unlocked bikes have been getting stolen out of camps the last couple of years. 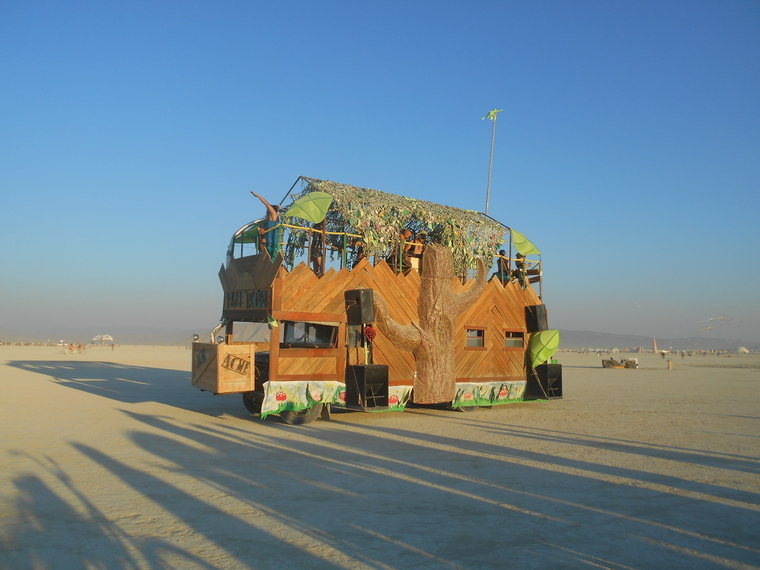 The photo above is the Treehouse Art Car from Victoria, BC, Canada. 5. Learn to cross the playa instead of sticking to the city streets. Who am I to talk? It took me until my third year to cross the playa. I was scared to. There aren’t a lot of landmarks out there. Visibility can be obscurred by dust storms and whiteouts. Understanding the city layout helps. The lamplighters light the three roads at 3 o’clock, 6 o’clock, and 9 o’clock from the city to the Man. They also light the road from the Man to the Temple. The lamps are meant as navigation aids. The big sound stages are at 3 o’clock and 9 o’clock. So if you want to check the music on the other side you just follow the road across the open playa. So if you are at 3 o’clock then follow the lit road to the Man and then on the other side pick up the lit road to 9 o’clock. 6. Don’t obsess about trying to meet up with a friend. One of my friends spent the first half of one burn trying to connect with a friend. He finally gave up so he could just enjoy his burn. If it happens it happens. 7. Use Burner Map with Facebook. This is the easiest way to find your friends on the playa because you can print it off before you go and it will list your friends and their camp and mark it on the map. Carry a small notebook and pen with you to note locations you want to return to. You won’t remember or find them again without doing that. A high point of my first time was an international pancake breakfast near Barbie Death camp. I couldn’t find it again. 8. Most events do not make it into the “What Where When” guide that you receive with your tickets. The events are listed online. You can look through before you leave your home and Internet connection. The last couple of years there has been a phone app called “Time to Burn“. The Rockstar Librarian puts together a list of music. 9. Sunrise is the best time to take photos. This is because of the light. The wind starts around 10 am. So early there’s no dust. Before you reach the playa you’ll want to seal your camera in a large freezer bag secured with electrical tape. You’ll need a filter to protect the lens from getting scratched. 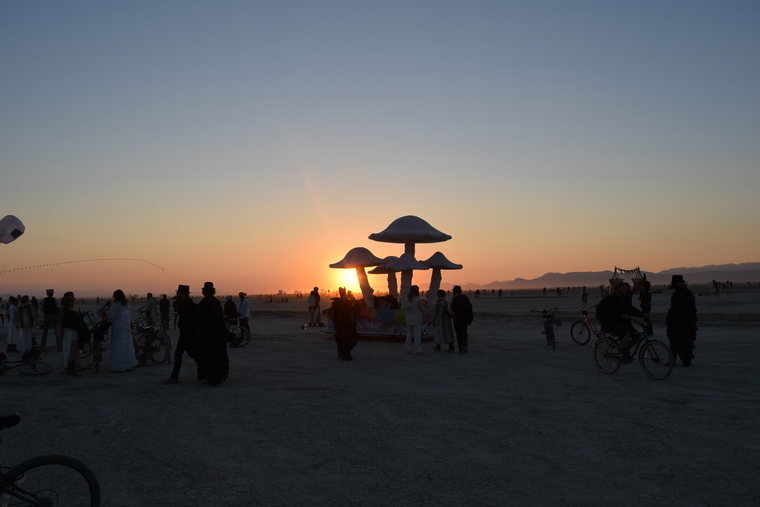 I was in my third year before I saw a sunrise at Burning Man. The traditional place to see one is at the Temple. If you want to see the playa chickens that’s where you can. Also Dust City Diner may be out by the trash fence serving breakfast. I saw them in 2013. Of course that’s when my camera batteries died. Buy lithium not the other kind for cameras. You’ll need to get up probably an hour before sunrise because you’ll have to bike from the city to the Temple. Important: If you are intending to go with a camp mate – make sure you know where each other’s tent is. We failed at this last year. Of course it doesn’t help when you have one of three identical tents. I have white cotton sewn or held by safety pins over the mesh. Most nights I try to be in bed by 2 am. You can sleep until 9:30 am if you open the door to let air in when it starts to warm up. Avoid pop up tents with mechanisms. The dust after a week will make it impossible to take down the tent. I speak from experience. If you get a pop up tent like my three – watch a YouTube video on how to close it. It took 10 people and an hour to close mine the first time I went camping with it. 10. Don’t stay up late the night before you drive off the Playa. In 2013 I stayed up on Burn Night until 4:30 am. On Sunday morning we biked to the Man’s ashes. People were cooking baked potatoes, popcorn, and bacon. Others were digging through the rubble for mementos and for the meteor that had been at the center of the Man’s flying saucer base. In the afternoon we were packed and headed out. It took hours in the heat to progress off the playa. It was dusk before we made it to the pavement. I noticed the RV two vehicles ahead of me was swerving from side to side. It was obvious the driver was falling asleep. I honked. The RV straightened out and the driver stuck his head out for fresh air. Then he was okay. We headed north before Gerlach and headed for Cedarville. We always eat at Woody’s. I always ask if they have milkshakes. They always say “no”. The year I don’t ask will be the year they have them. We saw some other burners from Victoria, BC. We usually do. After supper we looked for a motel but they were all full. 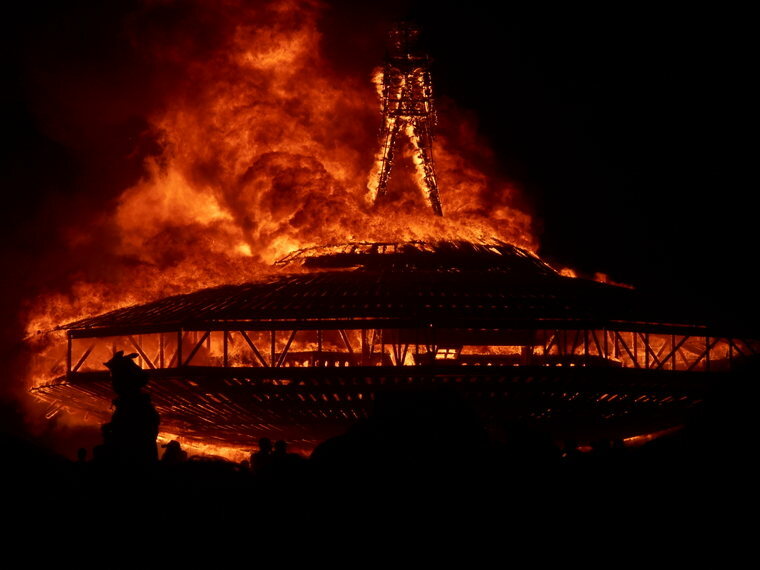 The population of Black Rock City had increased a lot in 2013. It used to be easy to get a motel room in Cedarville. Given no choice we continued to Alturas even though I was really tired. I stood behind a couple in a motel being told there were no rooms in town. I went back to the car. We were driving through town and Sparky pointed out a motel. I went inside and asked. There was one room covered in muddy dog footprints. There were intending to clean the carpet in the morning. I said we didn’t care about the carpet and rented the room for the night. In the morning after we left Alturas we saw all kinds of burner vehicles pulled onto the shoulder of the highway. People had been too tired to continue and had slept in their cars. Which is horrible because of the huge amount of stuff everyone has packed to take to the desert. It would be very cramped. It’s a long way to the next town through mountains. In 2014 I stayed up on Friday night until 4:30 am. On Burn Night I was in bed at my regular 2 am. It helped with the drive. I don’t even remember where we stayed. It’s always the drive from Hell going home. We had to be on the first ferry to Vancouver Island Tuesday morning. At least this year I wasn’t the only person driving for 12 hours.